Sound Connections is delighted to announce a four year strategic partnership with the National Foundation for Youth Music. 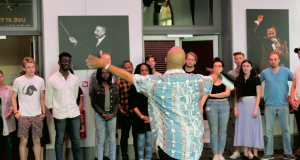 As one of 13 organisations awarded a Youth Music Fund C grant, Sound Connections becomes part of the newly formed Alliance for a Musically Inclusive England working together to promote diversity and cultural democracy in music education. Nationally the ambition is to transform music education in England to ensure that all children and young people can access music-making which is suitable for their needs and relevant to their interests. As the Fund C grantholder for London, Sound Connections will work closely with Music Education Hub lead organisations, Arts Council National Portfolio Organisations, Youth Music funded partners, grassroots and community organisations, music leaders and teachers, and young people over the next four years, 2018 to 2022. Young people – continued growth of Wired4Music, a network powered by people age 16-25 and hosted by Sound Connections. All Wired4Music activity starts with the needs and interests of young people and is co-created with its members. Workforce – needs driven professional development in a variety of formats, including training days, conferences, resources, podcasts, mentoring and apprenticeships. Sector – action research and advocacy to help London’s music sector think, learn and progress. Sound Connections will also continue to work with its strategic partners including A New Direction, the Bridge organisation for London, Music Mark and City Hall to closely align with other opportunities for young people in the capital. Sign up to our newsletter here > to receive ongoing updates about how we can best support you and your work.